Happy Easter to all my friends who celebrate. Things around here are pretty quiet. Not much to do but craft on Easter weekend if you are Jewish. I decided I'd better take a break, post what I have made, and clean up. It's a pretty nice day here, so I think we will all head down to the beach for a nice walk later. First up is a baby card that I made with my new Hello Foxy set as well as some paper scraps from Echo Park Hello Summer. 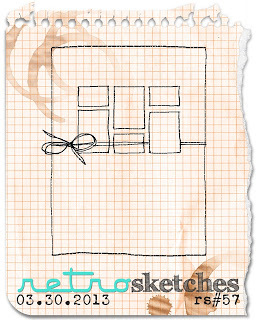 This card is for Retro Sketches rs#57 and Simon Says Stamp Anything Goes. I did a little paper piecing on the fox, and the heart is popped up and covered with Glossy Accents. 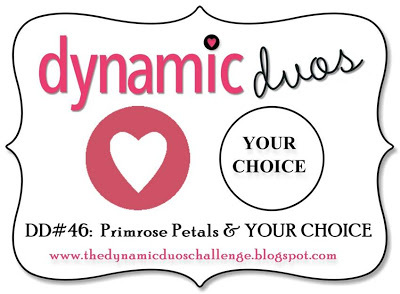 Next up, another baby card, this one for this week's Dynamic Duos DD# 46. I used Autumn Rose as my deep pink, and Memento Angel Pink for my 2nd color choice. I was inspired by this card by Christina. I used Watercolor Wonder for the stripes, and Whale Wishes for everything else. One more card for Dynamic Duos. This time, my 2nd color choice was Simply Chartreuse. I wanted to play around with my new Waltzingmouse Camellia set that I won. Next up is another card inspired by Christina. 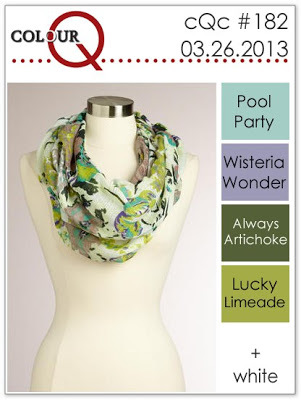 I am linking up to this week's ColourQ cQc #182 and the Chevon Challenge in the Moxie Fab World. I've got chevrons on my Happy Harlequins, and they are stamped in a chevron pattern--double chevrons today. This card is also for this week's One Layer Wednesday challenge to use a shape repeatedly on a one layer card. My last three cards use the technique taught in this week's Make it Monday #109: Watercolor Stamping Plus Embossing. This technique is harder than Betsy makes it look in the video. Lots of my inks ran together to create a funny shade of brown. 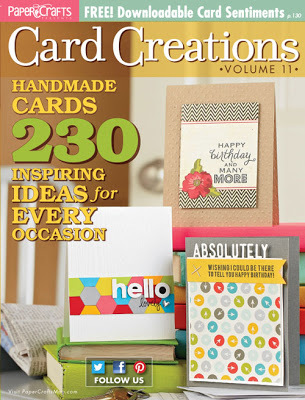 But, I did get it work a few times on some die cuts, so those were the ones I used to create my cards. This card uses Hibiscus Burst and Winter Wisteria. I omitted the white embossing on the smaller buds, because there would have been almost no color showing if I didn't. These next two cards use Hibiscus Burst, Berry Sorbet and Hawaiian Shores. Well, that's it for me for this weekend, so far. I'm not going to type up all the supplies, but please let me know if you have any questions. The paper and colors were to die for this month--just so pretty, bright and fun. I heard lots of chatter about the paper being too pretty to cut, but not for me! I was just wrapping up my Pattern Play on-line class when I took out my kit and started making my cards. So, that pattern paper went under the knife right away--you may see some designs that look a little familiar. I made 6 cards, and have lots and lots of leftovers . Pretty happy about that. 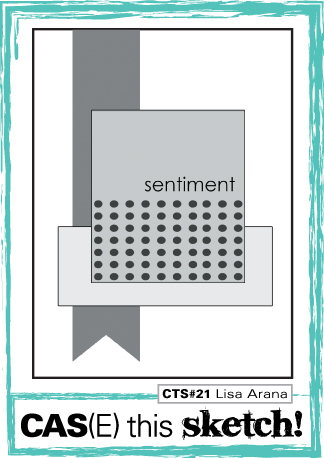 I am entering this card into the Speech Bubble Challenge in the Moxie Fab world, and I should also note that this card was inspired by one of the instructional videos in the Pattern Play class last week. That's it for me today. If you want a complete supply list, head on over to Tracey's blog. I am eager to see what the other members of our group did, and I'll bet that you are too. Thank you so much, Tracey, for sending such an incredible kit. My cards just flew together all on their own. I have been out of my craft room for 2 days, and it felt like forever. It was so nice to get back to 'work' (or play) and whip up a few cards for some of my favorite challenges. 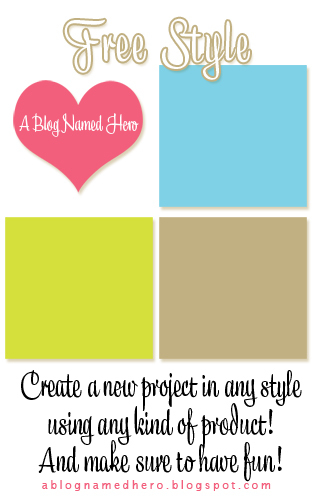 It's Laura Bassen day on the blog today--my first two cards are inspired by this super talented gal. My first card uses this week's color scheme at the Color Throwdown CTD235, and I followed Lauren's video tutorial on the Hero Arts site here on partial die cutting. Next up is a case of this super sweet card of Lauren's. 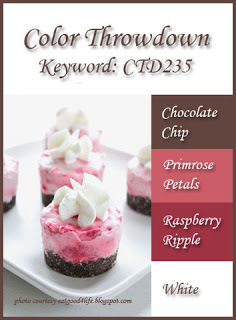 I used the colors from this week's ColourQ cQc#182. 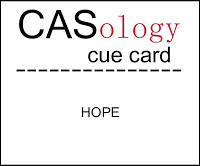 My next card is for this week's CAS(E) this Sketch CTS #21. I am trying to use what I learned in last week's Pattern Play class--I broke into another patterned paper pad for this card. 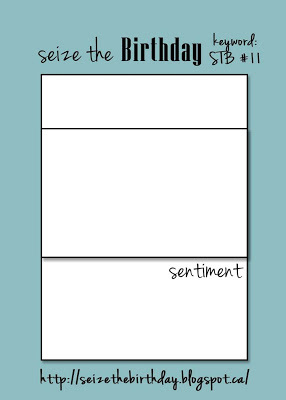 My last card is for this week's Seize the Birthday STB#11. I used the scraps left over from the card above to make this card. It is almost impossible to see that I embossed the card base with the Numbers Impression plate--but you can see it in person. My husband's birthday is Monday (no foolin') so I need to decide which of these cards will be for him. The challenge this week at Simon Says Stamps is Anything Goes, so I will enter all of these cards over at SSS, too. Hi there. I've been busy making birthday cards. I'm totally covered for birthdays--I just have to remember to send the cards. 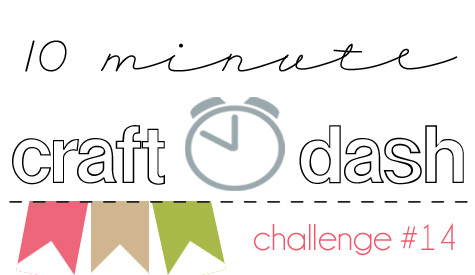 My first card is for this week's 10 minute craft dash. I made a super simple card--just one stamp 3 times and a sentiment. Why did I take 9 minutes? I just think things take a long time, even simple ones. I added lots of stickles and impressed with my Sunshine Impression Plate. Here is a picture of my little tool I made to help me line things up when I stamp with wooden stamps. I have shown this before, and have gotten lots of suggested names from my friends--Joyce-A-Ma-Jig and Lego-Ma-Jig are my favorites. 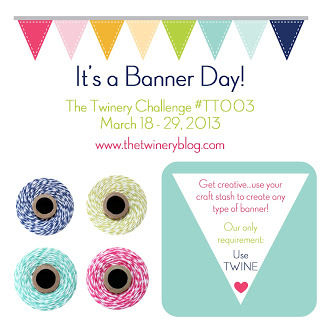 Next is a card for this week's challenge at The Twinery to make a banner. I used some scraps left over from this card, and Strawberry Twine to make this birthday card. Last up are some special order birthday cards. Who could look through my enormous stash of birthday cards, and want something custom? Why, Sarah, of course. She found this card, which I made and posted sometime last year. Decided that she would place a reserve on it, so I could give it to her in July for her birthday, and asked if I could make one just like it in blue and purple for her friend's birthday this Friday. Of course I would do that for her. And, because I could see where this was going, I made two. And, because we have been giving lots of gift cards lately, each card has a coordinating gift card holder. The sentiment on the card, and that balloon sentiment are both from Hero Arts Birthday Messages, so I'll be entering these cards into this week's A Blog Named Hero Freestyle challenge. 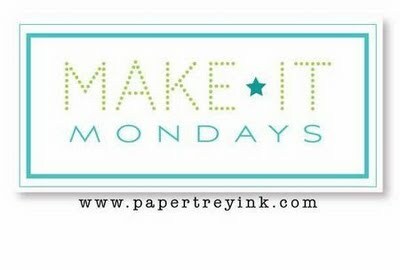 I'm back with more entries into this month's Papertrey Blog Hop. I decided to make a coordinating pillow box gift card holder to match with the card I made for the blog hop here. Wow--that Summer Sunrise balloon did not photograph well--trust me when I say it looks much brighter in person. Here is the card and pillowbox together. We got a bonus day video from the Pattern Play class yesterday. I used sequins on the card I made for that day, so will also be entering it into the PTI blog hop challenge. I stuck close to the design shown in the video, and broke into my newest pattern paper pad--Color Crush by American Crafts. I am also entering this card into the Chevron Challenge in the Moxie Fab world. Did I Really Make 6 Cards Today?